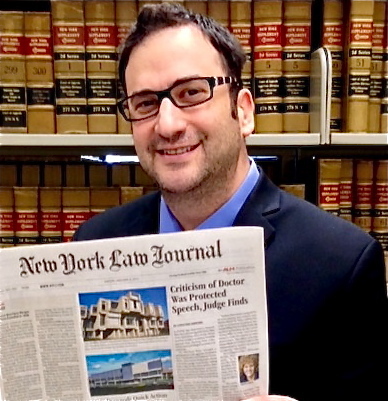 So there’s the story, as the feature on the front page of Friday’s New York Law Journal: Justice Cynthia Kern‘s decision throwing out the defamation case Dr. Michael J. Katz stupidly started against me and my co-blogger Samson Freundlich. And if the whole legal community didn’t already know that Justice Duane Hart had eviscerated Katz by repeatedly calling him a liar, they surely know now. Turkewitz said he was disappointed of the deep reluctance of judges to find cases frivolous and impose sanctions. “This was a really bone-headed lawsuit to bring, and all it did was make Dr. Katz look even worse,” he said. Now I think that boneheaded should be one word, and not hyphenated, but lexicography isn’t my long suit, and I suppose that is a digression for another day. While I was disappointed that Katz and his lawyers weren’t sanctioned, it’s clear to me that rebroadcasting in this suit the lacerating remarks Justice Hart made about Katz was one of the dumber moves I’ve seen in my 28 years practicing law. And now, due to the prominence of the story, the legal community also knows that it was the Nassau County firm of Ruskin Moscou Faltishek that led to this debacle. Well played, gentlemen, well played. Readers are left to guess for themselves why a firm would elect to start a case it must inevitably lose that also embarrasses the client.